Arbitrary waveform and pattern generator with 14-bit resolution, 2 analog channels, 8 digital channels, 100 MHz bandwidth, 40 Msample/channel memory, 500 Msample/s sampling rate. 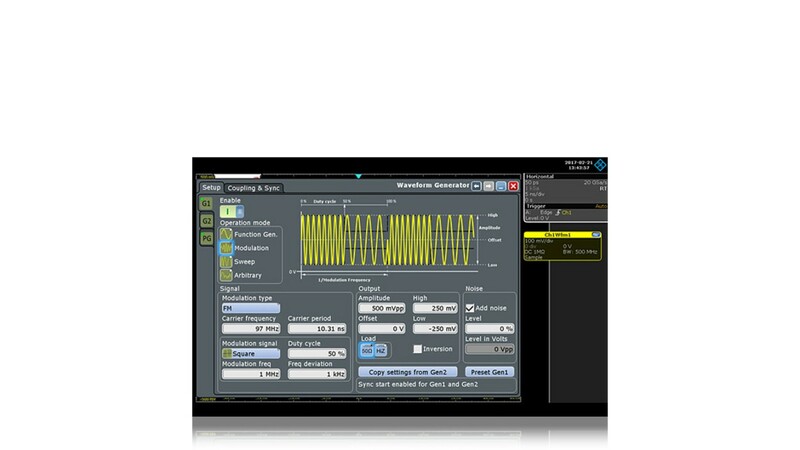 Waveforms and patterns can be imported as CSV files or copied from oscilloscope waveforms. Before playing signals back, the user can preview them to quickly check signal correctness. 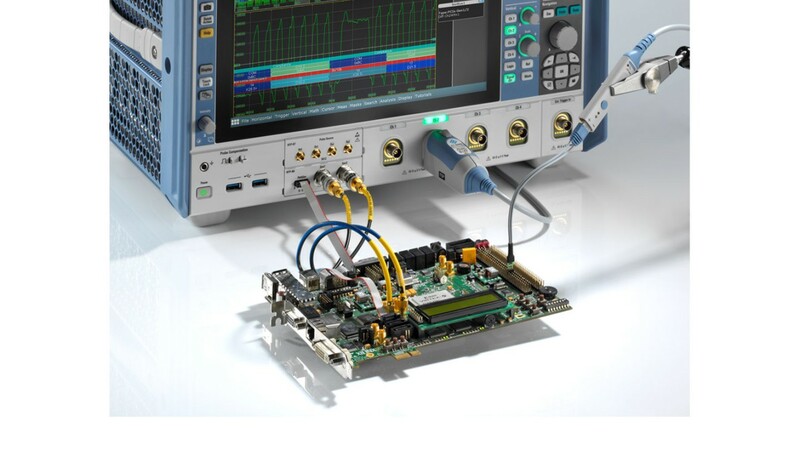 The R&S®RTP, R&S®RTO2000 and R&S®RTE oscilloscopes can be enhanced with a fully integrated arbitrary waveform and pattern generator. The generator provides 2 analog and 8 digital channels with up to 100 MHz bandwidth, 500 Msample/s and 14-bit resolution and can be operated as a pattern, function or modulation generator. It is suitable for education, design and R&D purposes. For testing differential devices, the generators can be coupled and offset from each other. With the offset capability of amplitude and phase in coupled mode, you can simulate both ideal and non-ideal conditions. Differential devices, such as differential amplifiers or I/Q mixers, can be tested against amplitude impairments and phase imbalances. Testing your device with real-world signals opens up a new method to test the margins of your design. 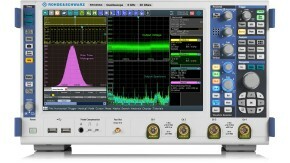 The arbitrary waveform generator lets you play back waveforms that are captured on the oscilloscope. 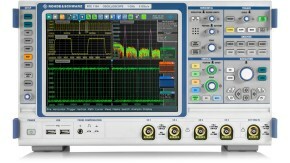 The captured waveforms can be manipulated by changing the amplitude and offset level or be superimposed with noise to evaluate a device against design criteria. Compliance tests can be fully automated utilizing the B6 arbitrary waveform generator, eliminating the need for an external signal source. 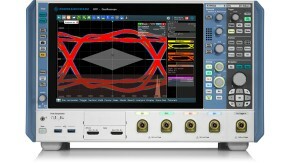 R&S®ScopeSuite is able to control the waveform generator and provide, for instance, the disturbing signal needed for Ethernet compliance testing. 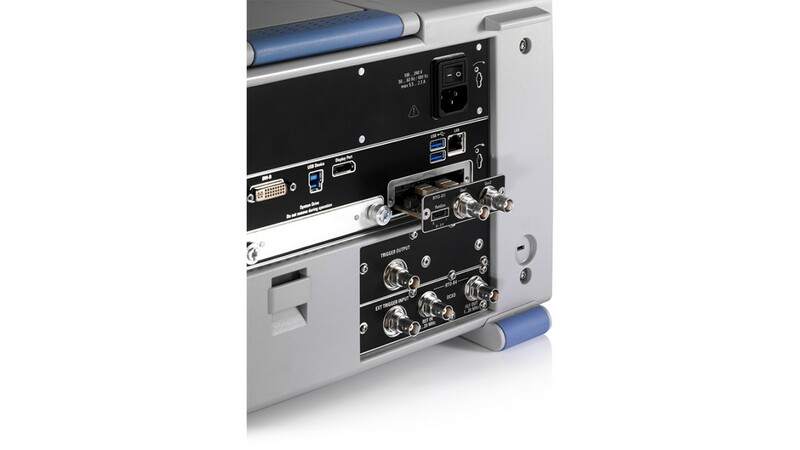 As a result, the R&S®RTO and R&S®RTP offer the most compact compliance test solutions on the market.